RE-INTRODUCED TRINIDAD FLEURON AS AN ADHESIVE "KILLER"
large part strike dated (M)Y 23 (1859) in manuscript on clear margined imperf. 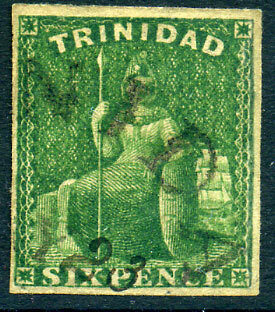 1859 6d deep (yellow) green (SG.28, Cat.£425). Prepayment to UK fully compulsory as of JA 1 1859 to be made up by Colonial 6 x 1d adhesives until higher denominations available. 4,000 x 4d, 9,000 x 6d, 7,000 x 1/- invoiced to Colony AP 14 1859 and issue date for these new denominations MY 9 1859 per SG catalogue. 1st and 2nd sailings to UK with 6d imperf. being MY 10 1859 and MY 25 1859. The earliest 6d imperf. 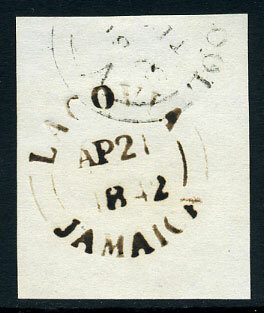 cover to London dated JY 26 1859 (ex Charlton Henry). Currently the only known example. Thought re-introduced at Head Office, or village, to assist with new denominations.